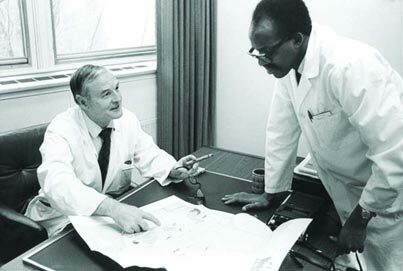 Kenya was transitioning from British colony to independent country and Dr. Njoroge Mungai, the newly appointed Minister of Health and Housing, faced a daunting task: the creation of a system of government-run hospitals in the country’s 74 districts. To complicate matters, he first needed to establish a medical school that would train doctors to work in these facilities. He turned to McGill for help. At the invitation of Mungai, Dr. Douglas Cameron, chair of the Department of Medicine and physician-in-chief at the Montreal General Hospital, and Dr. Alan Ross, chair of the Department of Pediatrics at McGill, visited Kenya to assess the situation. In response to their recommendations, the Canadian government formally requested McGill to help University College Nairobi establish two medical departments: pediatrics and internal medicine. Each department would be staffed by a team of four doctors (one associate professor, two assistant professors and one lecturer) responsible for a teaching unit of 40 to 50 beds at Kenyatta National Hospital. Arrangements were also made to give Kenyan postgraduates extra training to become clinical teachers. The McGill team approached their new responsibilities with gusto and even gave the wards a much-needed coat of paint—much to the astonishment of their Kenyan colleagues. “All of our staff fell in love with Kenya and would have stayed indefinitely had we not insisted on their return,” said McGregor, who traveled to Kenya on a number of occasions to visit the project. In 1972 the first group of doctors graduated from Kenya’s medical school. The school is still going strong; now named the College of Health Sciences, it turned out 100 graduates in 2006 alone.